Through a great friend, I recently had the opportunity to review an audiobook I've been eying for the past year or so. 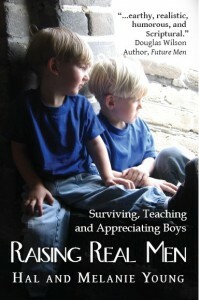 Raising Real Men, by Hal and Melanie Young (read by Hal Young) was an absolute delight. On their webpage, there is an endorsement by J. Michael Smith, President of HSLDA, that says, "This is a book that every family should have..." Prior to reading the book, I thought that was hyperbole. After listening to the book, I think it is only a very, very slight exaggeration. If you homeschool boys, this book is an absolute must read. It should go on a list of books that you re-read at least annually. Probably more often. I may start listening to it once a month. Seriously. If you have boys, this book is a must read. Yes, the authors homeschool. But very little of the content is homeschool-exclusive. If you only have daughters, and you homeschool, this book is probably still a very good read. Particularly if you think your daughters are ever going to be interacting with boys. And especially if Mom didn't have a houseful of brothers. If you only have daughters and you don't homeschool, you may not get much out of this book. Unless of course, you plan to interact with (and help your daughters interact with) boys, especially as they get into those teen years. In that case, this book would probably be a great one to read, but maybe you don't need to own it. Buy it, read it, and then pass it along to a friend who has sons. If you are non-Christian and are opposed to any Christian messages, well, then you might want to skip around a bit. Because this book is definitely written by a Christian family. Okay, maybe the HSLDA guy had it a bit closer to right than I first thought. It boils down to, I think this is a book every family should at least read, and those with boys should own and re-read regularly. I'm giving this book about a hundred stars, on a scale of one to five. Seriously. GET THIS BOOK. I grew up with brothers. I grew up in neighborhoods that tended to have very few girls. My Barbie doll dated GI Joe -- a real man. Ken was for the flighty Barbie dolls of those silly girls at school. And I grew up to have sons. Four of them, in a row. Followed by one little girl. (No offense intended, if your Barbie dated Ken. Really.) So maybe I understand boys a bit more than your average mom. Or maybe I tend to forget some pretty important things about boys, and I need Hal and Melanie to remind me. Did I agree with absolutely everything they had to say? Certainly not. I agreed with an awful lot of it though. First off, they make no claims that they have found THE one right way to raise boys, or if you don't do it their way you are not a good Christian. No magic formula, no one perfect way. They admit to making mistakes, they recognize other families will make other decisions. They have six sons. A couple are grown, some are still at home. The youngest is about the age of my youngest. It is clear on every single 'track' of this book that Hal and Melanie have serious, personal, real experience in raising boys. These boys are real, and the Youngs tell us that. You hear stories about the boys trying to boss (bully) younger siblings. They have sons who don't understand why they should have to change clothes more often than every couple of weeks. They have boys who can, and do, turn everything -- including sandwiches -- into a gun. For half of the stories, I was thinking "have they been watching my family?" For most of the other half, I was thinking, "Oh, so that is what I have to look forward to!" They also have two daughters, who (I believe) came after all the boys. Knowing how many "So you finally got your girl?" comments I have heard, I can just imagine if there were two more big brothers in that mix. They have struck an incredible balance on so many issues. They are certainly teaching that boys need to do boy things. But they are also coming down pretty solidly that boys should be helping with the cooking, cleaning, shopping, and laundry. They suggest making it sound more masculine -- so their boys serve as chef, for instance. Something I was already doing, which proves their ideas are terrific, right? And they have a realistic balance on things like college. I know the currently fashionable thing is to push that homeschoolers can only become entrepreneurs, and that college is expressly forbidden in the Bible. The Youngs say that you can't just dismiss college. We need good, strong, REAL men going into fields like medicine and law. Do you really want a future where there are no Christian doctors, no Christian engineers, no Christian CPA's? Some fields require college. Period. But college isn't for everyone either. They take on other touchy issues too, drawing a nice, realistic balance. Being written by BOTH Mom and Dad, there were just so many wonderful insights. I'm hearing Hal say things that my husband has told me and I didn't quite believe. Hearing it from someone else affirms that Dale is on the right track. And I'm hearing Melanie validate the struggle I have with understanding some of these boy points of view. And Dale is getting the female perspective from someone besides me. They are funny. Especially if you parent a boy. I would imagine, though, that even if your children are all girls, some of these stories would hit home. And this isn't a long, hard to read book. It is actually a pretty easy read, but with a lot to think about. I've implemented a lot of things as I listened. Some were things that Dale has been after me to change already, some were just slight adjustments in how we already were operating as a family. Some were totally new concepts. I started giving the boys to do lists for school. Dale has pushed that (or a schedule) forever. Now all four boys know what is expected of them in order to be "done." Wonderful. I knew I should. The Youngs helped me to see why. When we hit the grocery store and only have a dozen or so bags, we had been leaving the cart in the store and dividing up the bags between all of us. I'd insist on taking a bag or two, just like the boys. Now I'm letting them take care of me. I have always made a big deal about their assistance when we're shopping, but now I'm backing off and allowing them to do more. For whatever reason, boys cannot walk quietly. I deal with the normal, too high, volume of everything around the house. Except their tromping through like elephants crashing through the underbrush makes me crazy. "Walk! More! Quietly!" is always met by totally blank stares. Thanks to the Youngs, they now know that they need to be commandos when they are indoors. Cover a lot of ground quickly, but quietly. Can't let the enemies know where you are by stomping around. It hasn't worked overnight, but when they revert to their normal slamming down the heels walking style, I say, "Be commandos. Please." and it changes. They GET that. It is MUCH quieter in my house. Disclaimer: I received this book for free for the purpose of writing this review. No other compensation was received. The fact that I received a complimentary product does not guarantee a favorable review. I just posted about this book too, and I agree, it was a must read! I had zero brothers growing up and now have 4 boys already among the 2 girls. I've got a lot to learn! PS> I love your long, wordy reviews! Thanks for this wonderful review. I have had this on my wish list for months. I'm always amazed at how different boys are. It's wonderful, but sometimes I feel so unequipped! I have 2 copies of this book and love it! It is the best I've ever seen on the subject. I think I need this book...boys are very different creatures from girls and raising boys is definitely interesting. Thanks for the "wordy" (was it wordy, I didn't notice) review. My Barbie was rescued by G.I. Joe after being kidnapped by Darth Vader, or some other baddie, btw. I grew up with lots of brothers (7), one sister and a Barbie doll just wouldn't have survived - so I didn't have one! I now have 3 boys and 1 girl (and very little sympathy for that girl heehee! - been there done that!) and I still don't get the boy thing! Definitely adding this book to my must read list, but I'll get the audio book for hubby. Great review - thank you! I have had my eye on this book for quite some time. Entered your giveaway too! I grew up with brothers and no sisters, and always wanted boys. I had two girls first and was always so proud of what "tomboys" they were...until I had a boy. Wow is he ever a boy. When I found out I was pregnant with a boy I began scavenging the market for boy information. I listened through Dobson's info on raising boys, and Raising a Modern Day Knight and a few others. I have seen this book too, but haven't had the opportunity to read or listen to it. After your review I'm definitely putting it on my list. Thanks for the good info! Oh please, can I win the audio book? I was one of two girls and my dad was the only boy out of 3, my mum the younger of 2 girls. Not much boy-rearing experience there. I only have 1 male cousin but he was lucky enough to grow up on a cane farm, a great place to grow real men. I always wanted boys and I love my 4 but they do bamboozle me sometimes. I follow Raising Real Men on Facebook but don't go there often. I have always liked their posts but would love a whole book of their ideas. Nice to hear that you and a few others whose opinions I value think highly of this book. If I don't win it looks like I will have to find my Paypal account password. Great review! I've heard about this book too and have it on my list of "need to read." I have one son as of right now and we homeschool and I have two daughters so this book would be very relevant. I already know at my son's young age of 21 months that he is different then my girls. I could use all the help I can get to teach and train him as the Lord would have. I would love the actual book, but my second choice would be an audio book IF the authors were the ones reading it. I've listened to another author read book and it was SOOOOO much better that way. I have four sons and I was the only girl with 3 older brothers. I think the book may have been written with me in mind. I would love the audiobook because my hubby and I enjoy listening together. Thanks for sharing about this book. It's on my MUST READ list. I want to do a better job raising my son and want to better prepare my daughters for the men GOD has planned for them. You've intrigued me! I've added this book to my Goodreads list and I am sharing it on FB. Thanks for the review! I can't wait to read it.